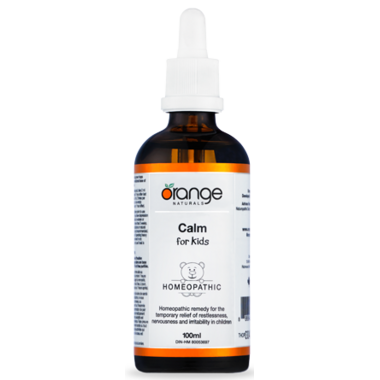 Orange Naturals Calm for Kids lest these simple drops bring peace and calm to your little ones. Wonderful for use before or after birthday parties, busy days or long car rides. Everyone will be smiling. It’s always a challenge to settle children who are feeling ‘geared up’ – whether it stems from a long day’s outing, a big family party or a long time spent traveling in the car. Calm for kids gentle remedy will help to promote mental calmness and reduce irritability, over-excitement and restlessness in your little ones. Even bedtime will seem less of a challenge. For general dosing, ages 0-11 years: take 0.5 ml, 3 times per day; age 12 years and up: take 1 ml, 3 times per day. Cautions: Consult a healthcare practitioner prior to use if you are pregnant or breastfeeding, and during use if symptoms persist or worsen, or if new Consult a healthcare practitioner prior to use if you are pregnant or breastfeeding, and during use if symptoms persist or worsen, or if new symptoms develop. Do not use if seal is broken. Keep out of reach of children. Bought this product for my daughter who suffers from growing pains and seems to be working.